A complete experiment for investigating Rotational Inertia. Designed for use with PASCO Capstone software. In this experiment, the rotational inertias of a ring and a disk are determined by applying a torque to the object and measuring the resulting angular acceleration. A known torque is applied to the pulley on the Rotary Motion Sensor, causing a disk and ring to rotate. The resulting angular acceleration is measured using the slope of a graph of angular velocity versus time. The rotational inertia of the disk and ring combination is calculated from the torque and the angular acceleration. The procedure is repeated for the disk alone to find the rotational inertias of the ring and disk separately. The rotational inertia of the ring and disk is calculated from the angular acceleration obtained from the slope of this angular velocity vs. time graph. Friction in this compact setup can be neglected in this compact setup. 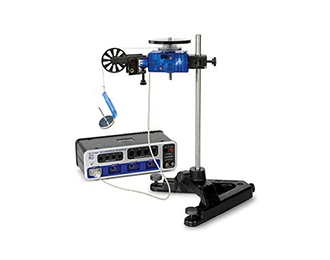 The Rotary Motion Sensor is a versatile tool which can be used in a variety of other experiments.